It has been my mother's ten year long wish to visit this prodigious residence of Lord Lakshmi Narasimha. During my week long stay at Hyderabad with my parents, when the topic of Ahobilam came up in casual conversation, I looked at my mother, and said let's go day-after-tomorrow. Amma looked at me with both eagerness and apprehension. She has been told that she would not be able to do this on her leg (three surgeries on one leg in the recent years), and my father is also too old to do this. Nevertheless, we decided that it was now-or-never. Coincidentally, the day of our visit coincided with swati nakshatram (the birth star of Lord Narasimha) and Ekadasi. We boarded a train from Secunderabad to Kurnool at 730 AM. The train reached Kurnool at 1 PM. We hired a taxi to take us to Ahobilam (We paid 3000 Rs. that included the return journey. I strongly suspect we overpaid atleast 500 Rs. ), and reached the temple town at 430 PM. This delay was mainly due to the difficulty in negotiating with taxi-cab rentals. The ideal way would have been to make the 400 km long journey from Hyderabad to Ahobilam by car, or take a bus from Hyderabad to Allagedda, and another one from Allagedda to cover the last 30 kms to Ahobilam. We are not a particularly bus-loving family, so we chose the more time-consuming way to travel. 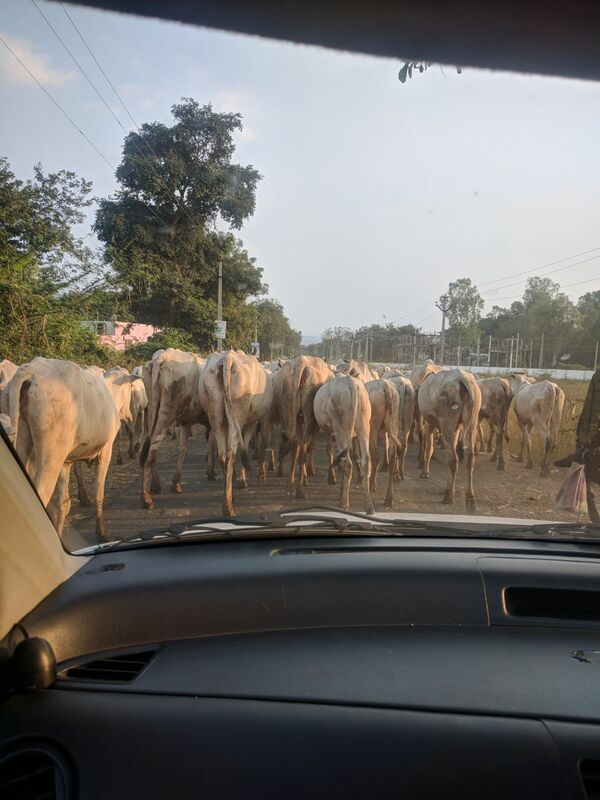 We also experienced a brief, and joyful delay due to a herd of cows heading back home along the road. Having been completely brought up in a city, I have never see so many cows (over 300) at one time, all calm and gentle. We stayed at the Malolan guest house, which is conveniently located adjacent to the Prahlada Varadha Narasmihaswamy temple. The manager, Mr. Badrinarayanan appears to make all the big decisions in the town related to where people stay, what they eat, and how much they pay autos/ jeeps to travel within the town. We also partook all of our meals at the Ahobila Mutt adjoining the guest house. The meals were very simple fare, but was extremely tasty, and felt like home food. The room that we stayed in also was very simple. Nothing extraordinary, but it was clean, and the window overlooked the gopuram of the Prahlada Varadha temple. So, we were quite satisfied with the stay. We paid Rs.800 for 28 hours of stay in the room. The meals are part of voluntary donation towards the annadanam scheme of the Ahobila Mutt. Most people in Ahobilam are conversant with both tamil and telugu. The main temples in Ahobilam all close by 5-530 PM, making us too late to visit any of the principal deities among the "Nava-Narasimha" temples. The Prahlada Varadha temple is, however, open until 830 PM. After quickly refreshing ourselves, we walked to have a glorious darshan of the Lord Narasimhaswamy and Amrithavalli. Here we found out that there would be a viswaroopa darshanam the following morning at 5 AM (on the day of swati nakshatra), followed by an abhisekham and tirumanjanam. We paid Rs. 500 to take part in this service (only two people are allowed per ticket), and returned to the guest house to retire early for the night. The next morning, we attended the viswaroopa darshanam as planned, and returned to the guest house by 7 AM. At that time, the breakfast (hot pongal and sambar) was served at the mutt, and we departed with an assigned guide by 8 AM. Only my father expressed a mild disappointment that we did not get chakkara pongal as prasadam after the abishekam. We took an auto to a parking point that is 250 steps below the Ahobila Narasimha temple. We started climbing this first flight of stairs at 840 AM. After a wonderful darshan of the Ugra Narasimha (the presider over Guru/Jupiter) who resides in a cave, we were called back by the temple sevaks who were bringing out a hot pot of prasadam. (Anyone's guess what it was? Steaming hot chakkara pongal). This brought a 1000 W smile to my father's face, and any apprehension he had until then about being able to make the upcoming strenuous climb vanished from his mind. The real climbing test only starts at this point. We began an arduous trek through the hills, through rivulets and boulders. While some people were pious and strong-hearted enough to do this barefoot, we wore shoes. I silently asked Adisesha to forgive my transgression. (The hills are believed to be the manifestation of Adisesha. Srisailam is supposed to be at his tail, Ahobilam at his stomach, and Tirumala at his hood.). I was thankful for the guide who hand-held my father and saved him from a couple of slips on the rocks from turning into anything disastrous. Three kms and several steps later, we found ourselves at the Jwala Narasimha temple. This is the location where Narasimha swamy held the demon Hiranyakashipu on his lap, and killed him with his claws. The temple has three idols of the God in an ugra (angry) form. The first one shows him breaking out of a pillar. The second shows him fighting with Hiranyakashipu, and the third shows him tearing out his stomach. The idol shows him holding the hands and legs of the asura on his lap with two of his hands, tearing him open with two other hands, wearing a garland of his entrails with two more hands, and holding his signature conch (sanghu), and the wheel (chakra) in his last two hands. This idol is the controller of Mars (or sevvai) among the navagrahas, and worshipping him is said to remove doshas (or imbalances) pertaining to that graha. A pond of fresh water adjacent to the temple is known as rakta kunda, where Narasimha washed himself after slaying the demon Hiranyakashipu. Due to the eminence of Swati nakshatram, there was a larger crowd than usual at these temples, but nothing that a city person does not see on a festival day at a local neighborhood temple. 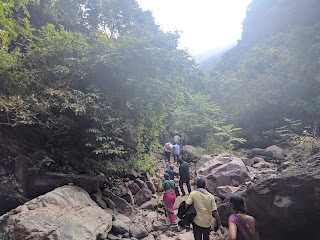 We finished our darshan by 10 AM, and started heading downwards. After descending from Jwala Narasimha, we started the ascent towards Malola Narasimha Swamy. Here, the God is in a calm posture, while embracing Goddess Lakshmi ("ma"). This deity controls Shukran or the planet Venus. We reached Malola at 11 AM, and it was smooth descending from this point on. On our way back, we also had the darshan of Varaha Narasimha temple, where he is in the form of Varaha (boar), with his snout embracing Bhoomi devi (Lakshmi). Here, he controls the Rahu graha. We reached the parking lot by 1145 AM. From here, we hired another Auto to take us to Karanja Narasimha (Chandran/ Moon), Chatravata Narasimha (Ketu graha) and Yogananda Narasimha (controller of Sani/ Saturn) temples. At Karanja, He is believed to have given darshan to Anjaneya Swamy. Lord Hanuman didnot recognize Narasimha Swamy, until he gave a darshan with a bow and arrow, three eyes, and a serpent hood. The symbolism educates that he is no different from Rama or Shiva. At Chatravata, he is smiling, and seems to be enjoying some music. Lastly, at Yogananda, the God is in a yogic posture. This is where he taught Prahlada (his foremost devotee, and the son and heir to Hiranyakashipu) the science of Yoga. Having successfully visited seven of the "nava-Narasimha" temples in the morning, we returned to the Mutt at 1 PM. 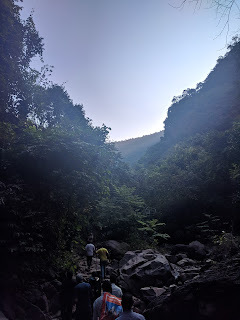 While climbing the hills in the morning, I constantly reassured my parents that only this part of the journey would be difficult, and it would be smooth sailing henceforth. All further deities could be visited with vehicles taking us to the temple doorstep. How wrong I was! 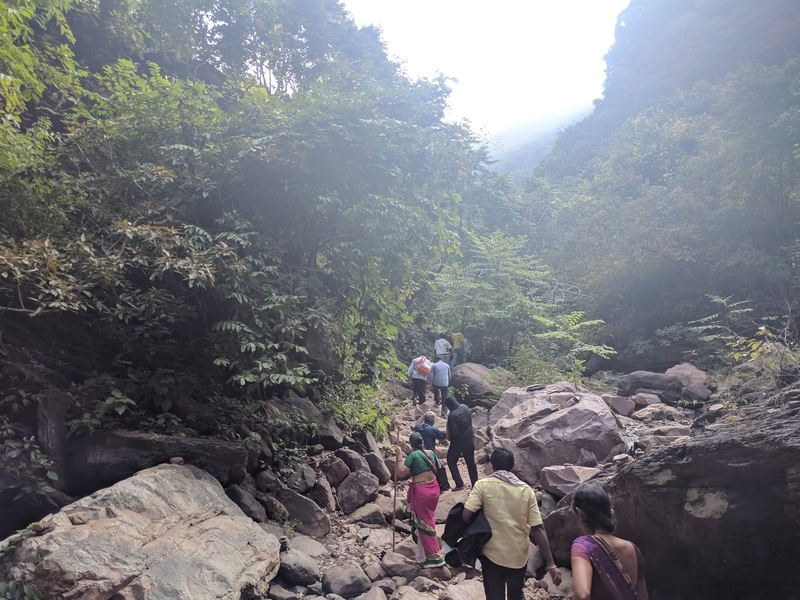 While it was true that the walking was minimal since the return from Varaha Narasimha temple, the afternoon was no less challenging! 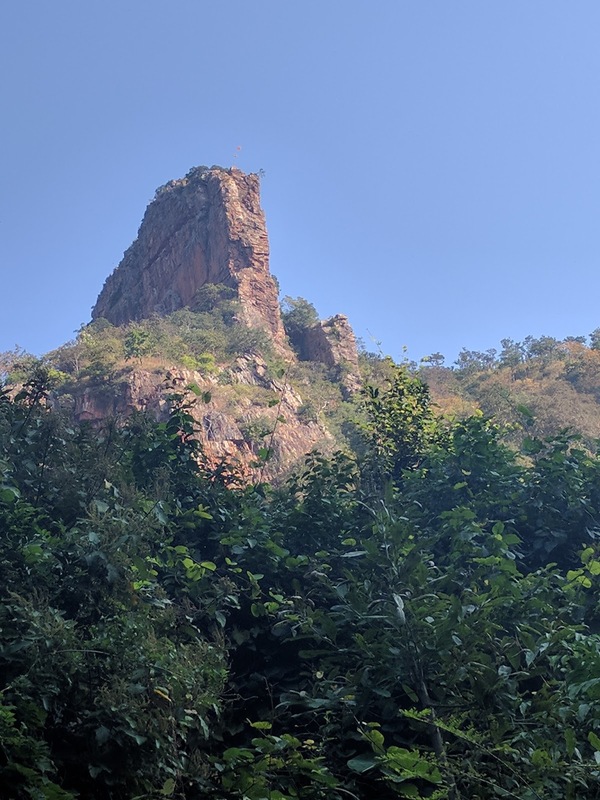 After a quick lunch, we hired a jeep, shared with three others (A total of eight people including the driver) to take us to Pavana Narasimha (presider over Mercury/ Budhan) and Bhargava Narasimha (Sun/ Suryan) temples. This journey was in many ways more arduous than climbing the hills. Pavana Narasimha is located deep within a forest which has no roads to speak of. The jeeps are in a terrible condition (I imagine even a brand new jeep will only last three trips into the forest before reaching such a state), and the path into the forest is full of boulders, trees scratching the sides, and paths that tilt the jeep 60-70 degrees on each side with alarming frequency. As there were some old ladies in our group, my father and I made the mistake of taking the back seat in the jeep. The ride to the temple takes one and a half hours, with over an hour inside the forest. Every joint in my body was aching, with multiple hits to my head. I can't even imagine what my poor father went through. I was much more vocal with my complaining. The forest department check-post midway through the forest does not allow visitors after 330 PM. After our darshan here, and expiating sins of all our prior janmams, we were ready to head back out of the forest. It was on our return journey, that my father's seat in the jeep suddenly broke. As there were no handles to hold on to in that treacherous road, he was holding on tightly to the bottom of the seat. This resulted in him injuring his finger. We arrested the profuse bleeding temporarily with some cloth, but it did not look good. There was no doctor between the forest and Ahobilam, without passing through the Bhargava temple as well. We visited the last of the nine temples, and headed back to Ahobilam and a doctor, who gave proper care to his finger. The cut was deep enough to expose his veins. The jeep driver completely absolved himself of any moral responsibility. The lesson here is to completely avoid the back seat in this jeep, and carry a first-aid kit. Sit in the middle or in the front if you must. I sat in the middle seat for a while on our return, and there is no doubt that the journey was infinitely more tolerable. I should add: infinitely more safe. After a successful completion of darshan of the nine deities on the day of Swati nakshatram, we took a bus to Allagedda from Ahobilam at 815 PM. We reached Allagedda at 9 PM, and boarded a volvo bus to Hyderabad at 11 PM. We reached Hyderabad at 5 AM the next morning with no further incidents. The difficulty in accessing majority of these temples has kept the number of visitors at a manageable level. It is because of this, the nature around this place is also well-preserved, and offers a serene and divine setting to this wonderful place of pilgrimage. Despite our minor mishap at Pavana, I hope that they do not develop the roads too much, which will only destroy the forests completely.